PARIS (CNS) — A French cardinal took the stand in court Jan. 7, the first day of a civil trial for church officials accused of covering up abuse by a priest. Cardinal Philippe Barbarin, 68, testified in the case against him and others accused of covering up abuse by Father Bernard Preynat, who has confessed to abusing minors at Lyon’s Saint-Luc Parish, where he ran a large Catholic Scout group in the 1970s and 1980s. French newspapers said Father Preynat had been moved to a new parish in Neulise after his crimes were reported to Lyon Cardinal Albert Decourtray, who died in 1994. Father Preynat was removed from parish work in August 2015. He reportedly has written some of his victims and confessed abuse; his trial will be separate. Nine people who said Father Preynat abused them brought the case to court, saying church officials were aware of Father Preynat’s actions for years, but allowed him to be in contact with children until 2015. The Associated Press reported Jan. 7 that prosecutors initially threw out the case for insufficient evidence. Cardinal Barbarin’s lawyer says his client never obstructed justice because the statute of limitations had passed on the acts in question by the time Cardinal Barbarin was informed. At the trial, Cardinal Barbarin said when he initially heard of the accusations, he encouraged one of the alleged victims to contact other victims and, “thanks to that,” the case against Father Preynat was able to be built, AP reported. 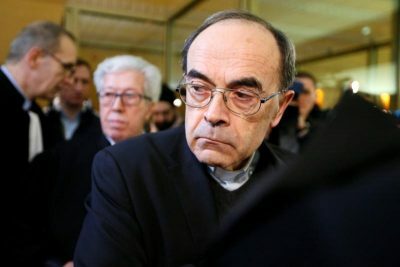 Cardinal Barbarin testified that he sought advice counsel on how to handle abuse accusations against Father Preynat from the Vatican’s Congregation for the Doctrine of the Faith. Spanish Cardinal Francisco Ladaria Ferrer, then secretary and now head of the Vatican’s doctrinal congregation, is also named in the trial. However, in September the Vatican informed the French government that any conversation Cardinal Ladaria may have had with Cardinal Barbarin regarding the case would have occurred within the context of exercising his official functions on behalf of the pontiff and, as such, would be covered under internationally recognized immunity rules. The French Catholic daily La Croix reported the victims are seeking a symbolic compensation of one euro and want to continue to appeal for an end to the three-year statute of limitations in cases of pedophilia. La Croix reported the plaintiffs hope to prove that the archbishop and his entourage failed in their obligation to report Father Preynat’s acts of sexual abuse, not only when they first learned of these acts but also for a long time afterward when they kept them a secret. Under France’s penal code, failure to report abuse carries a three-year jail term and a nearly $50,000 fine.